Rome, 28th February 2018 - The commitment of the NRDC-ITA for a deeper interaction with Non-NATO entities continues; works are in progress to set the conditions for a closer collaboration with CASD, Centro Alti Studi per la Difesa, the Centre for Italian Defence Higher Studies, the highest-ranking study institution in the field of managerial training, security and defence studies. 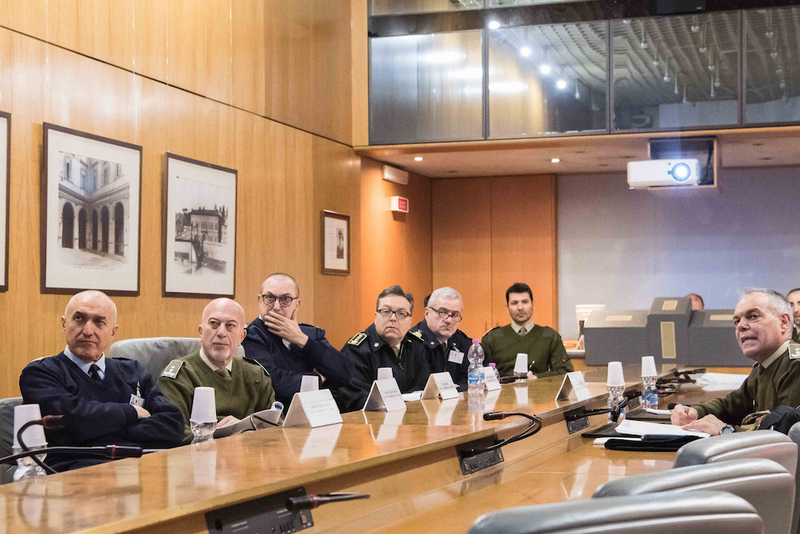 Today, NRDC-ITA Chief of Staff, Major General Maurizio RICCÒ met in Rome with Major General Carmelo CUTROPIA - CASD Chief of Staff, Brigadier General (Financial Police) IODICE - Deputy Director and Coordinator of the Institute for Advanced Defence Studies (IASD), Rear Admiral Maurizio ERTREO - Director of the Military Centre for Strategic Studies (Ce.MISS), Brigadier General TRIA, Brigadier General CATTANEO - Deputy Directors of the Joint Services Staff College (ISSMI) and other CASD Branch Heads. The meeting has been held in order to define ways and means of cooperation between the NRDC-ITA HQ and the Centre to be implemented with a Memorandum of Cooperation as required. Under discussion the proposal of the NRDC-ITA to offer courses in the area of operational planning and exercise scripting provided by experienced Subject Matter Experts to CASD and its Components (ISSMI, IASD, CeMISS e CeFLI). In addition, cooperation will be realized for information merging on common areas of interest and study. CASD will provide support for a common effort in the Knowledge Development process onarea of emerging crisis.